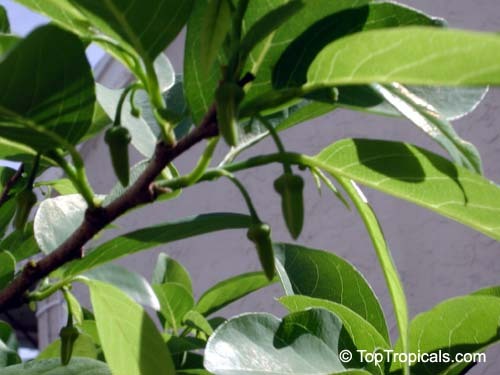 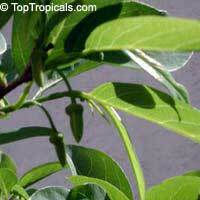 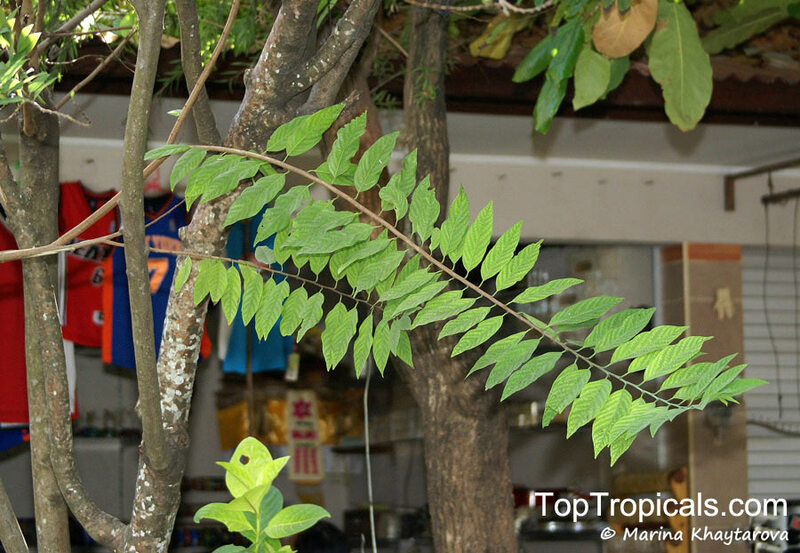 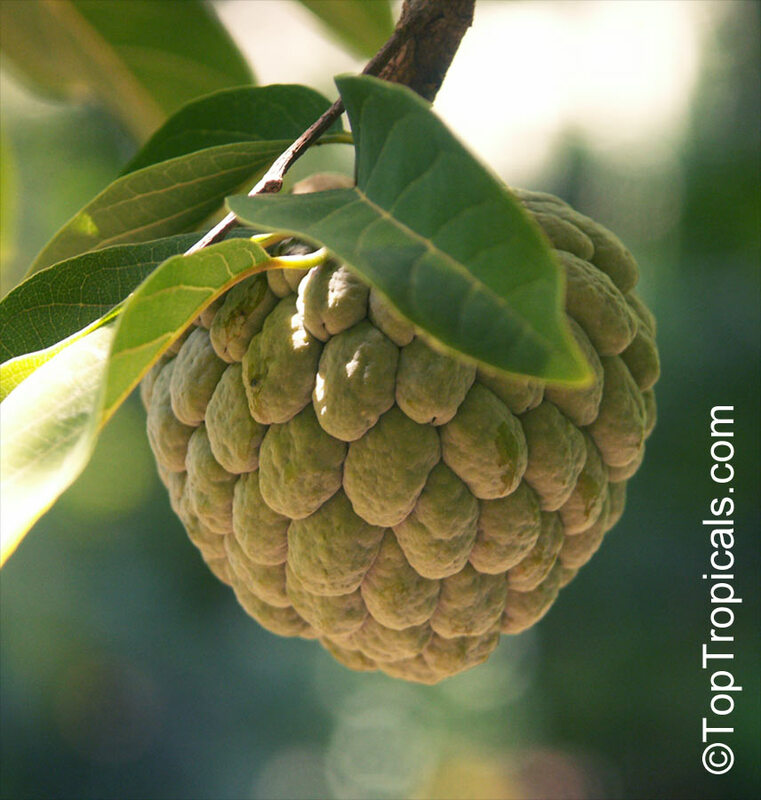 Very highly regarded in tropical and subtropical areas. 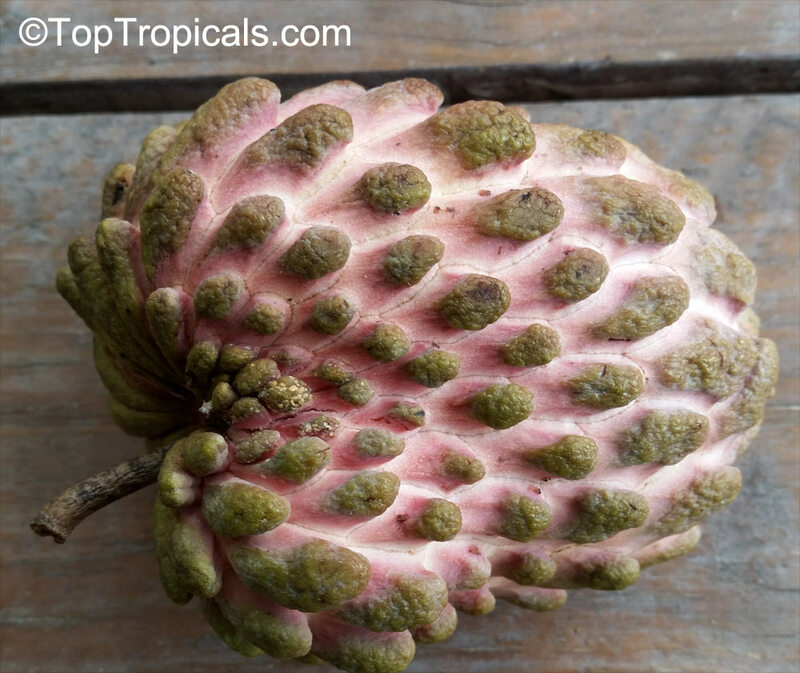 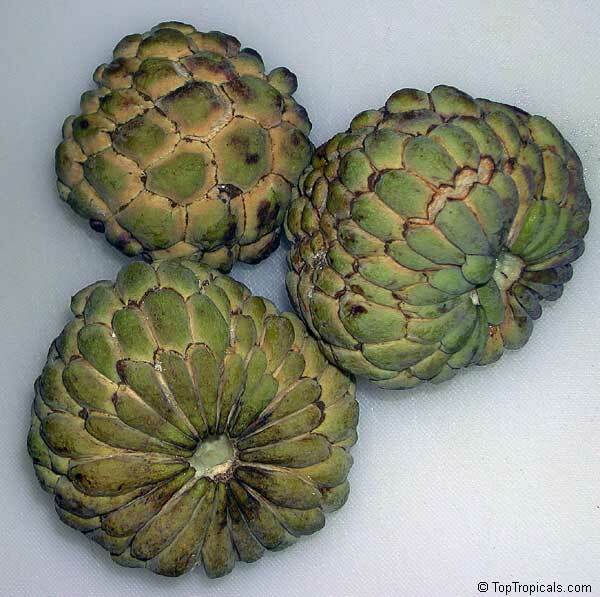 Fruits with sweet custard-like pulp are from 3 to 5 inches in diameter with a lumpy green skin and upon maturity the fruit has a bluish or white blush. 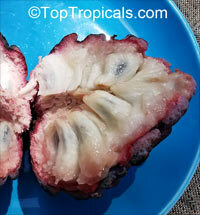 Some varieties are developed that have a red blush or red skin which are much more attractive. 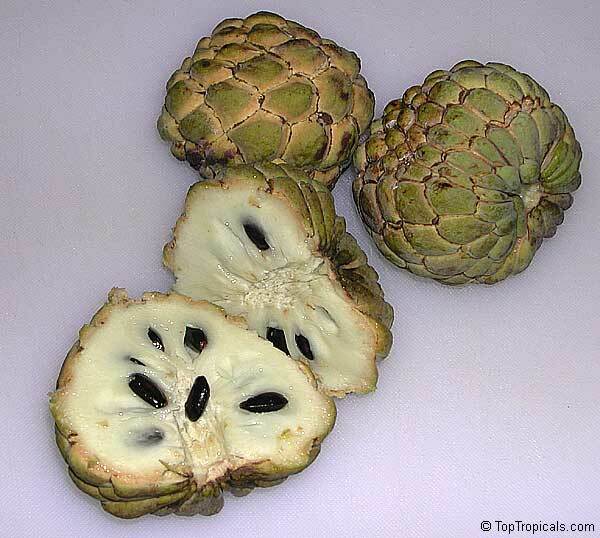 At maturity fruits have a custard like white pulp with small black seeds and the sweet flesh is eaten fresh or used for milkshakes and ice creams. 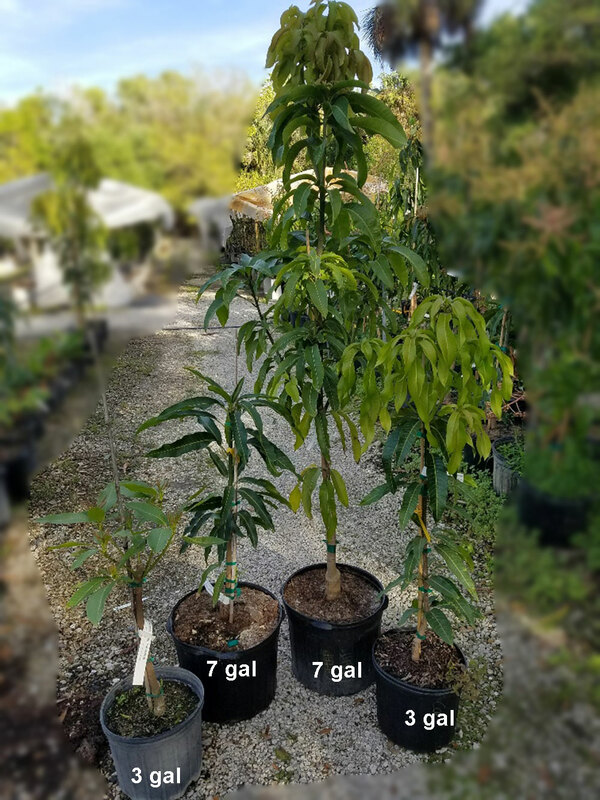 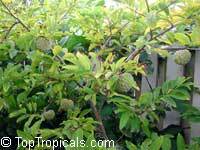 Sugar apples make great container plants, too, so if you don't have much space try growing these in a 10 or 15 gallon tub, and they will still reward you with a number of delicious fruit. 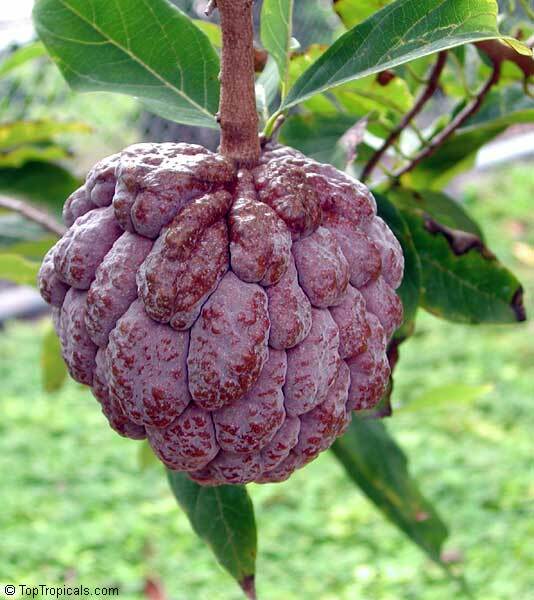 Older trees may continue fruiting into January during warm winter. 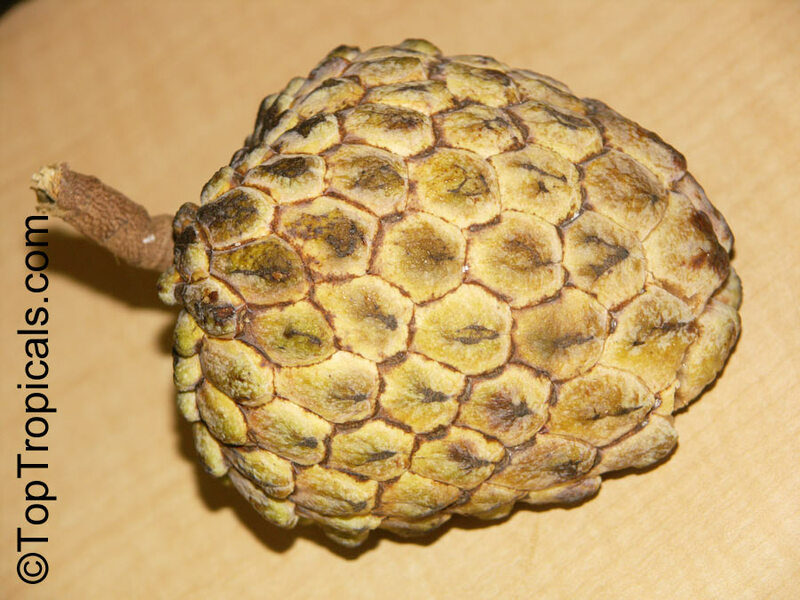 Trees reach full dormancy during cold winters. 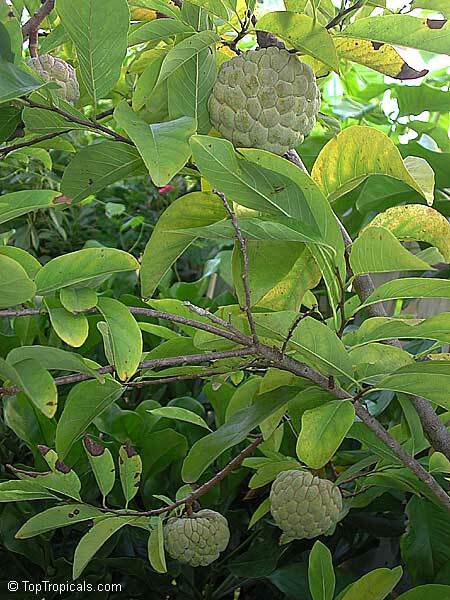 Varieties: Thai-Lessard, Kampong Mauve. 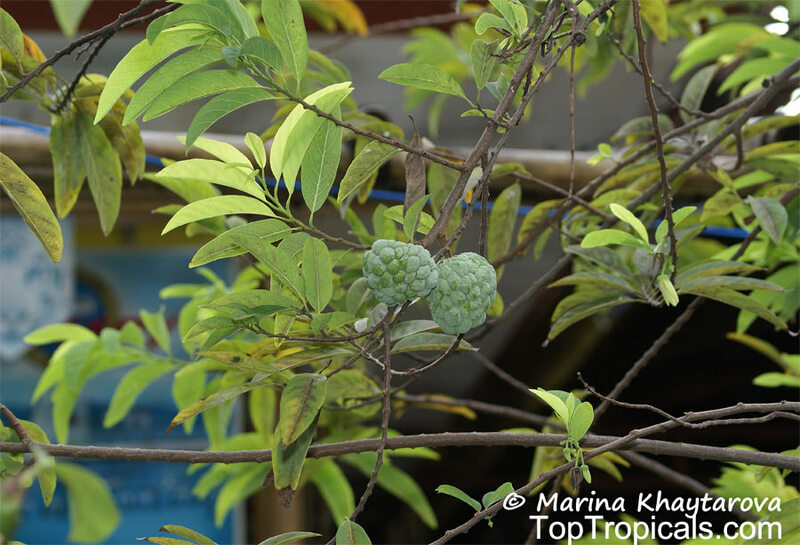 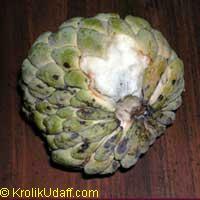 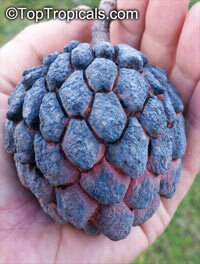 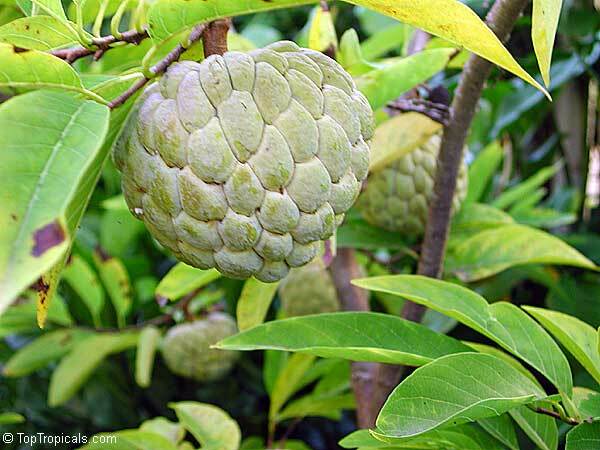 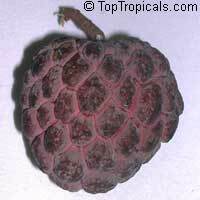 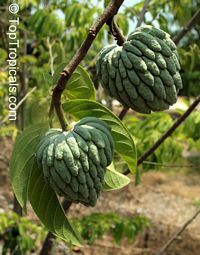 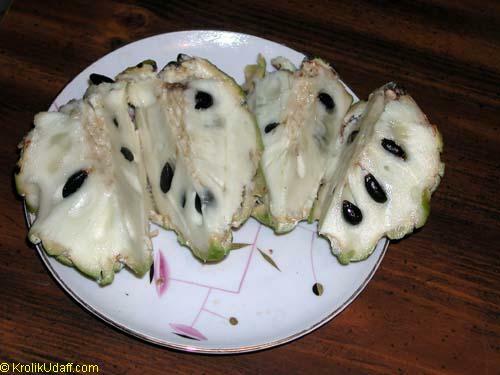 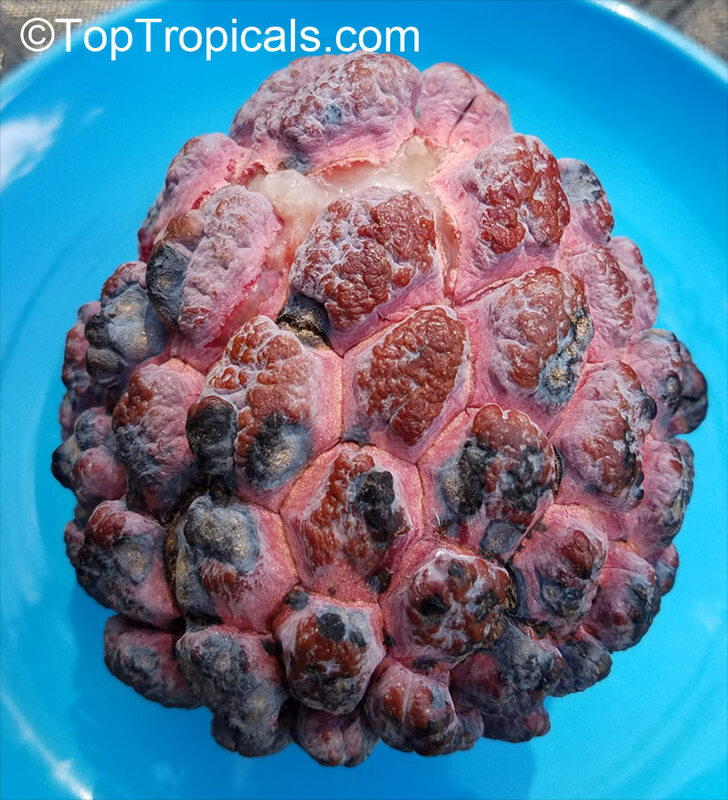 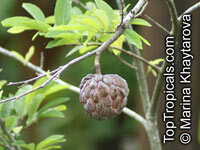 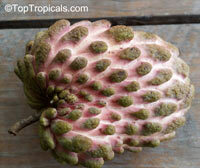 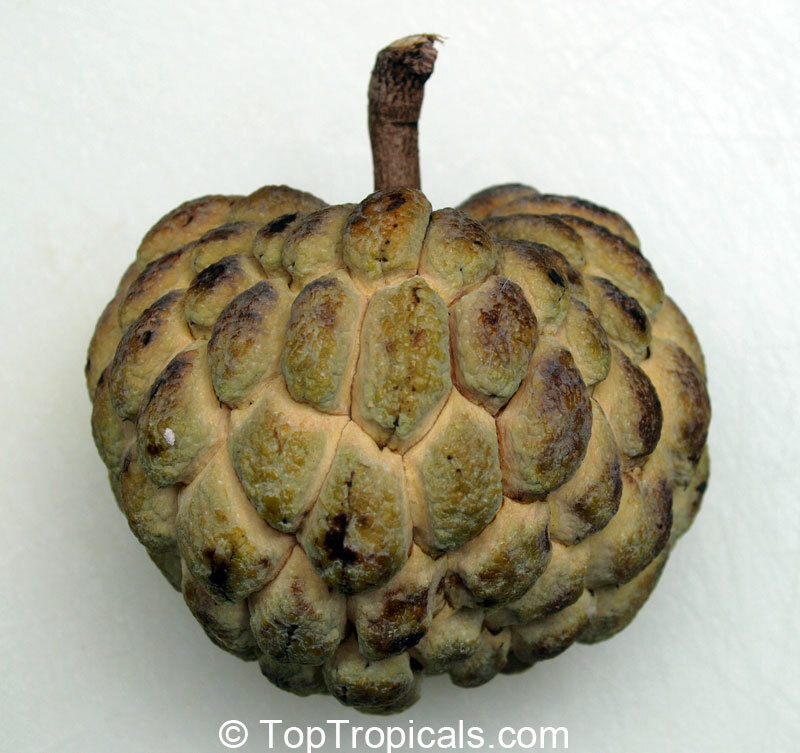 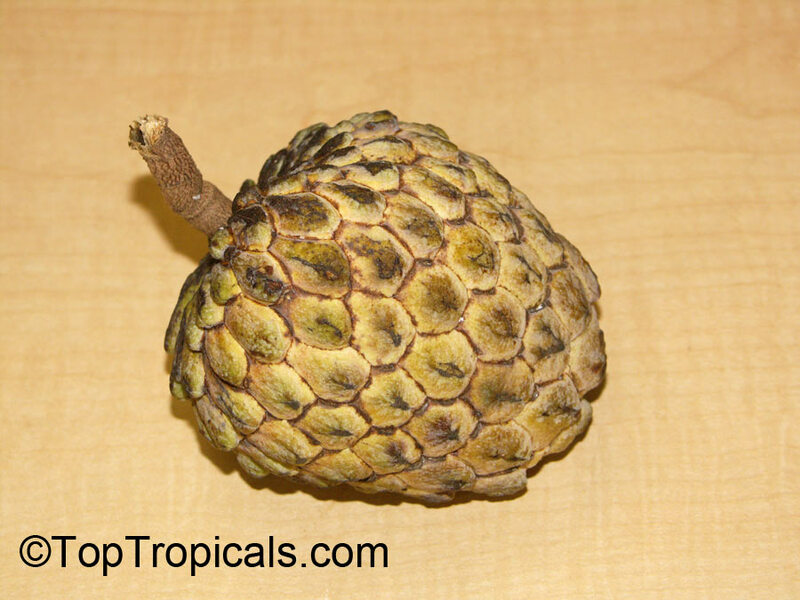 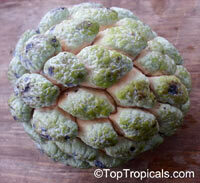 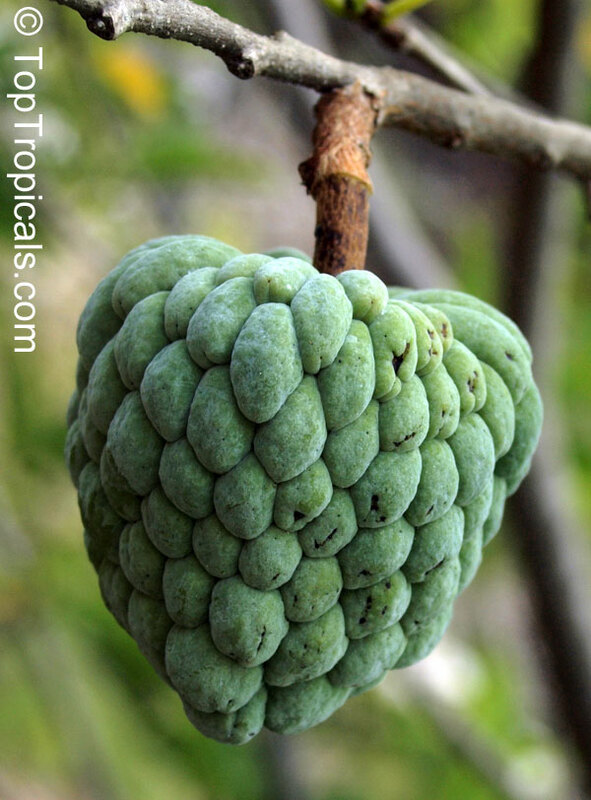 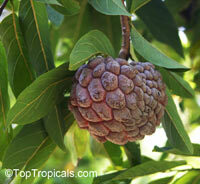 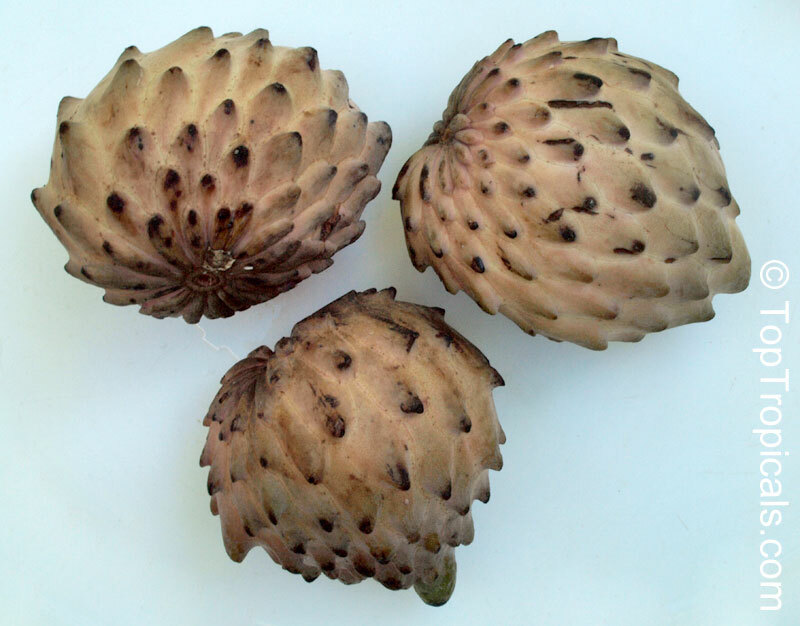 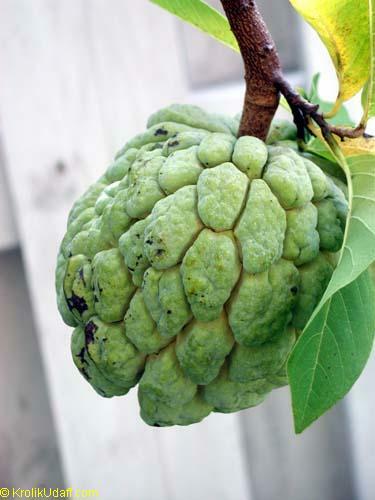 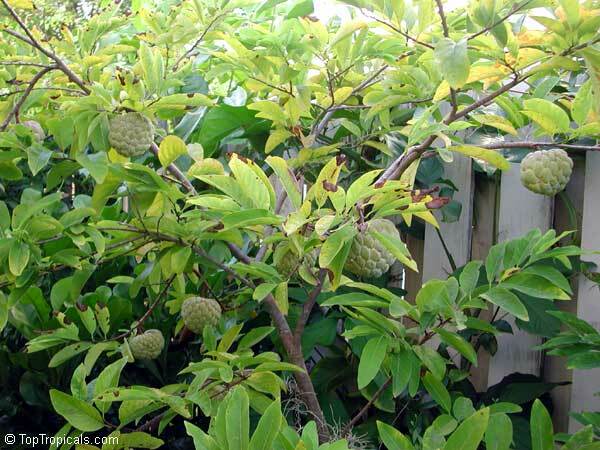 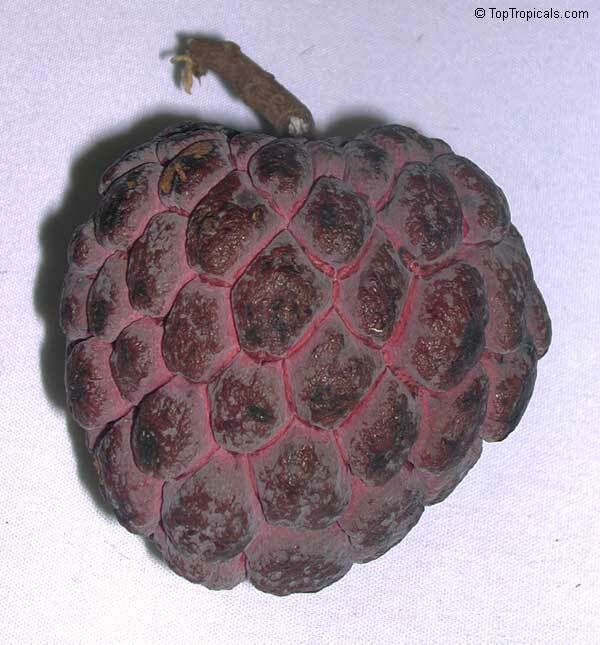 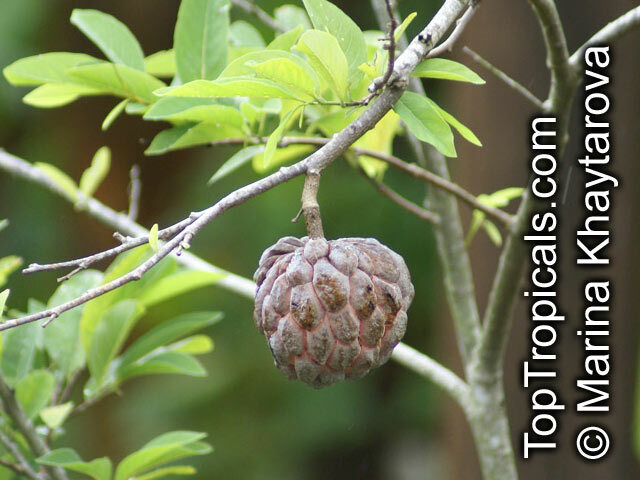 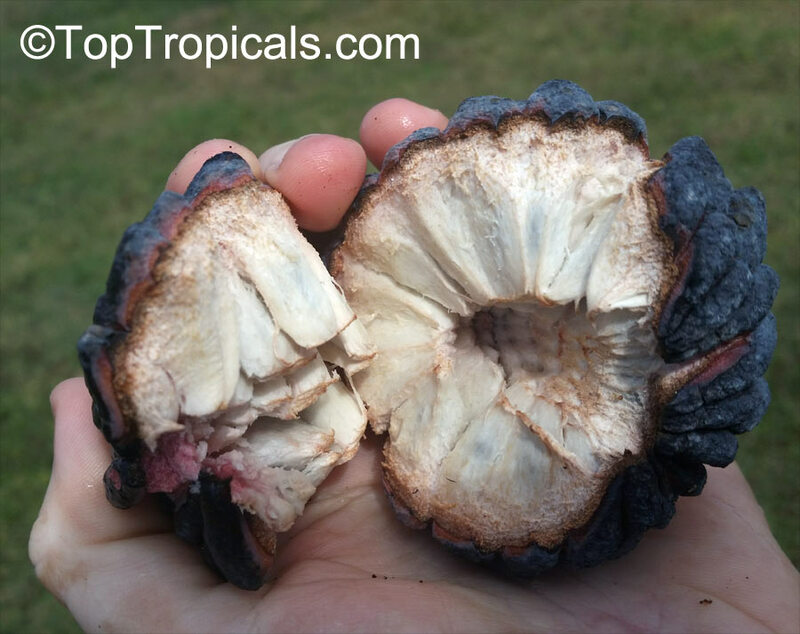 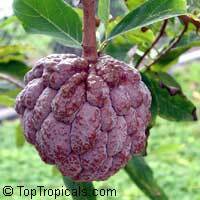 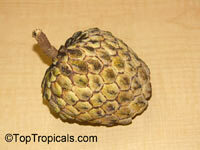 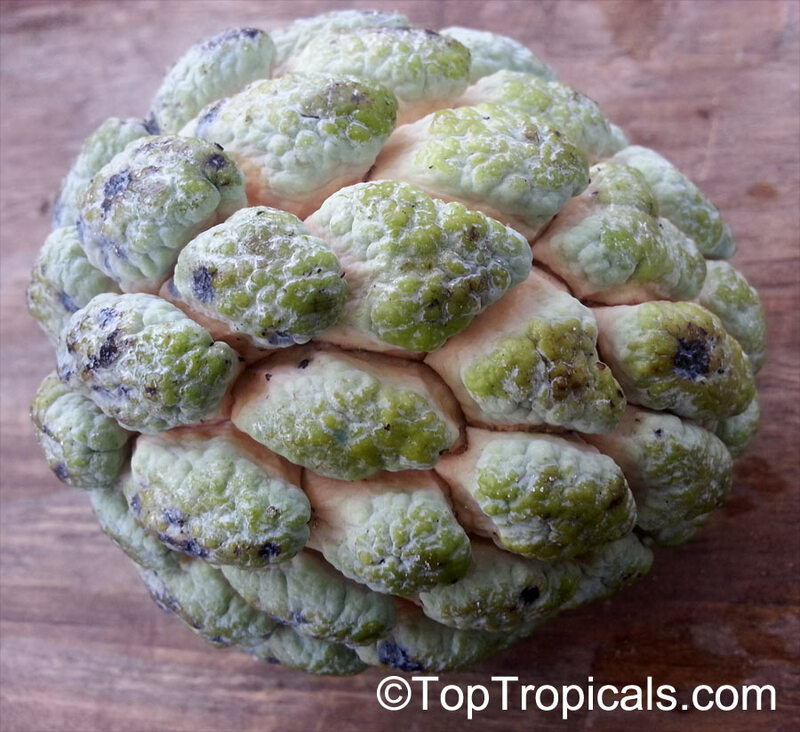 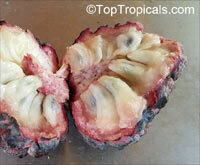 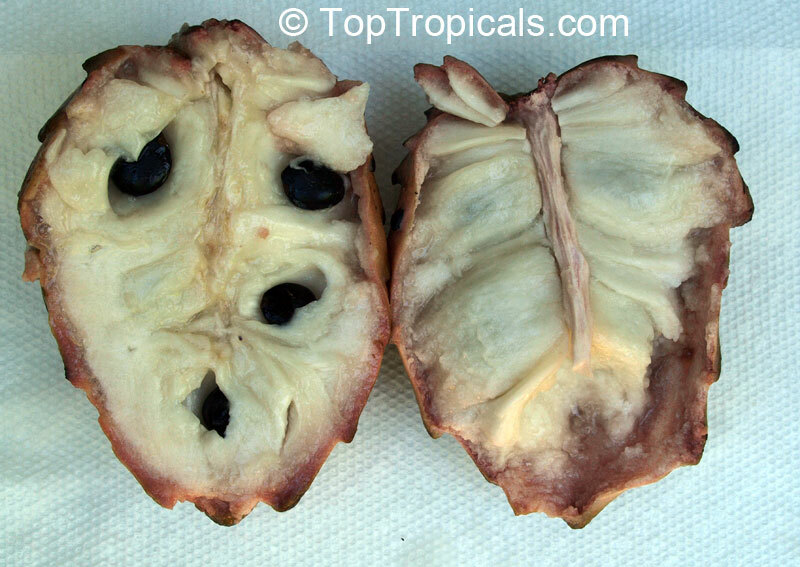 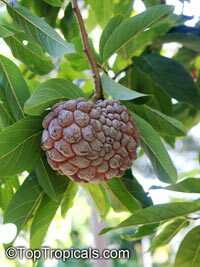 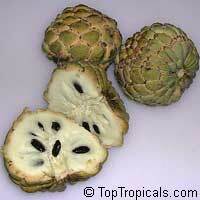 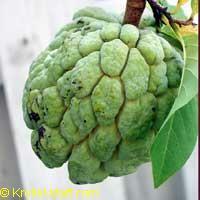 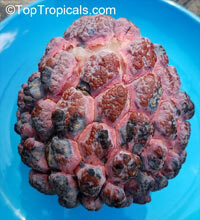 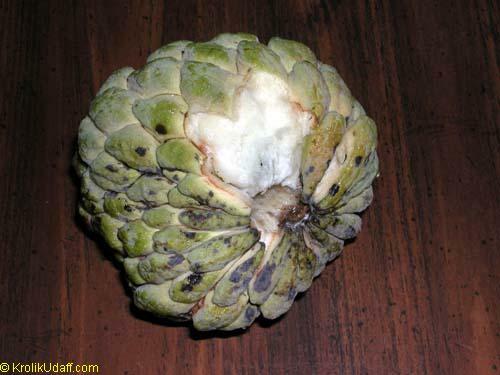 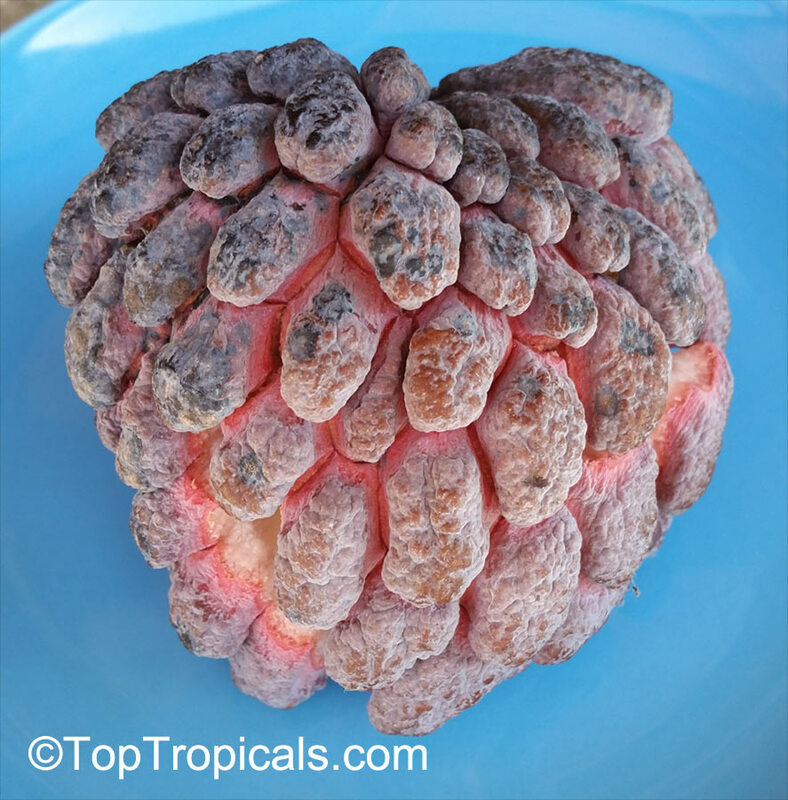 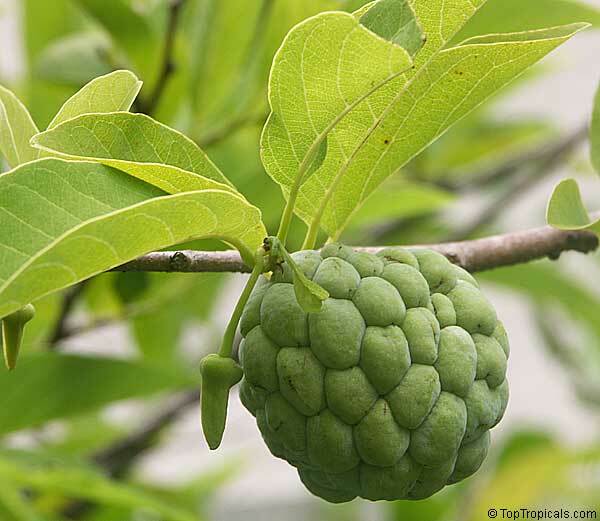 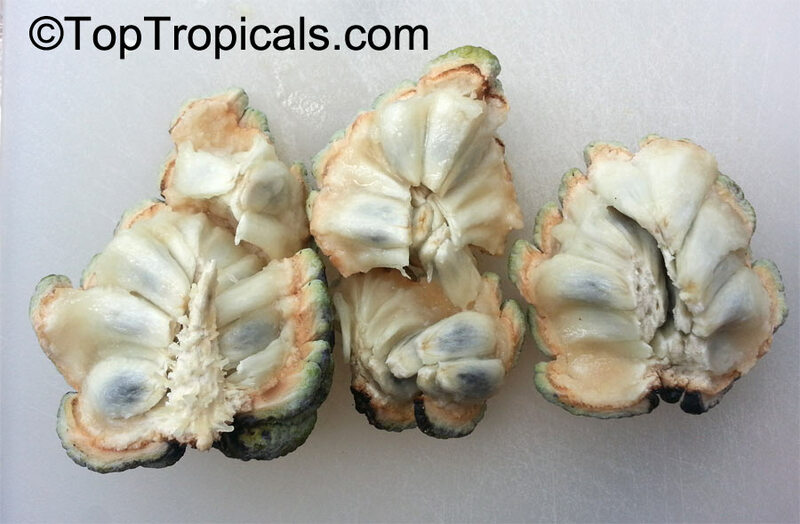 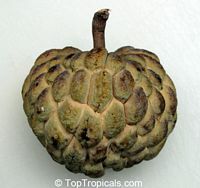 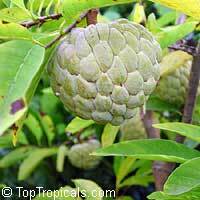 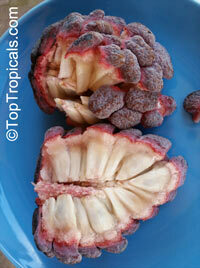 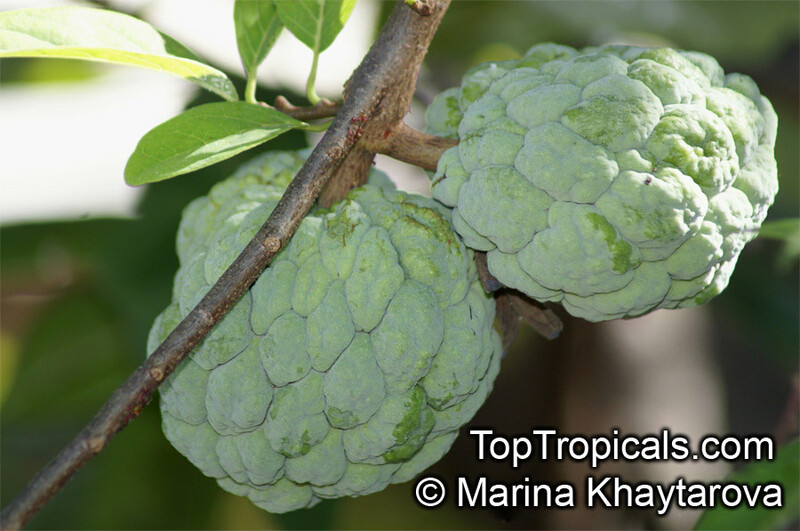 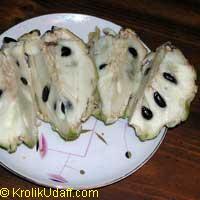 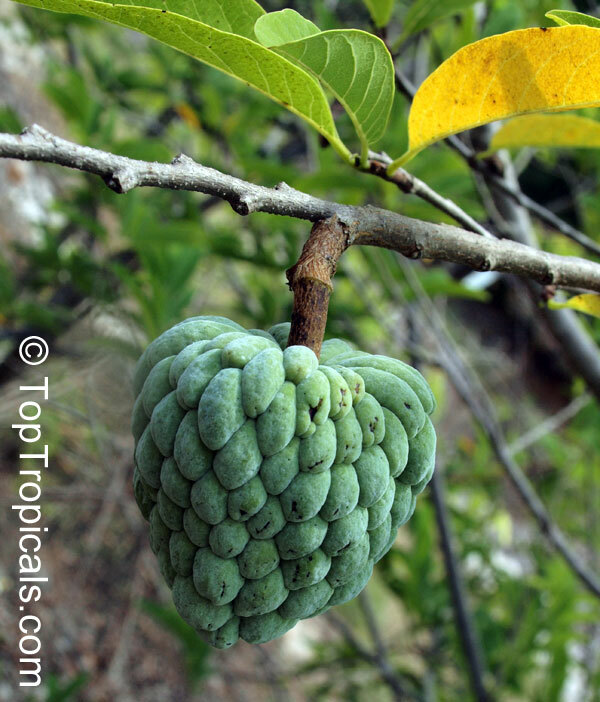 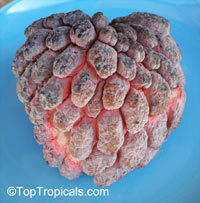 Read more about Sugar Apple. 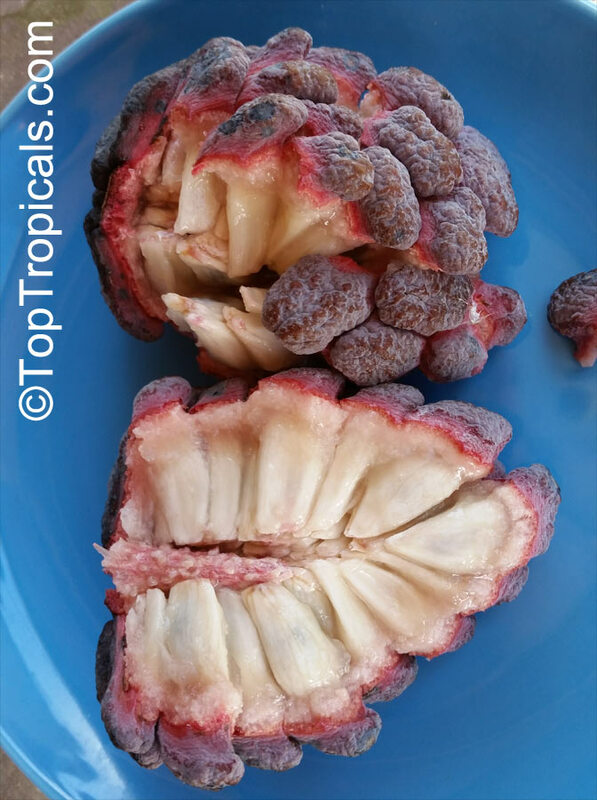 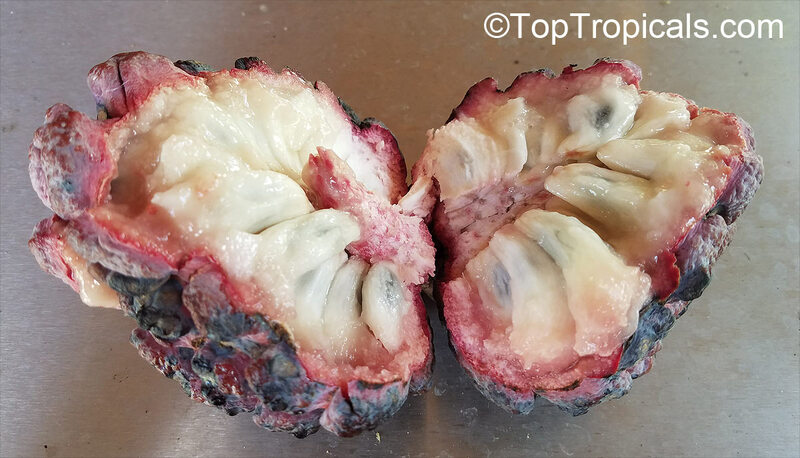 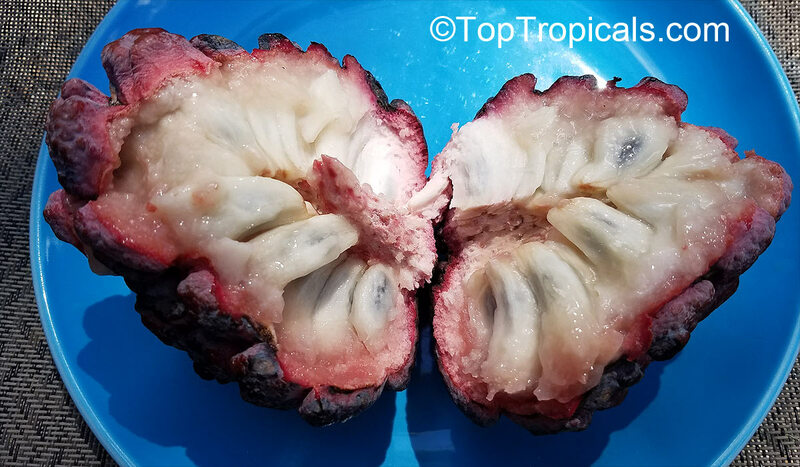 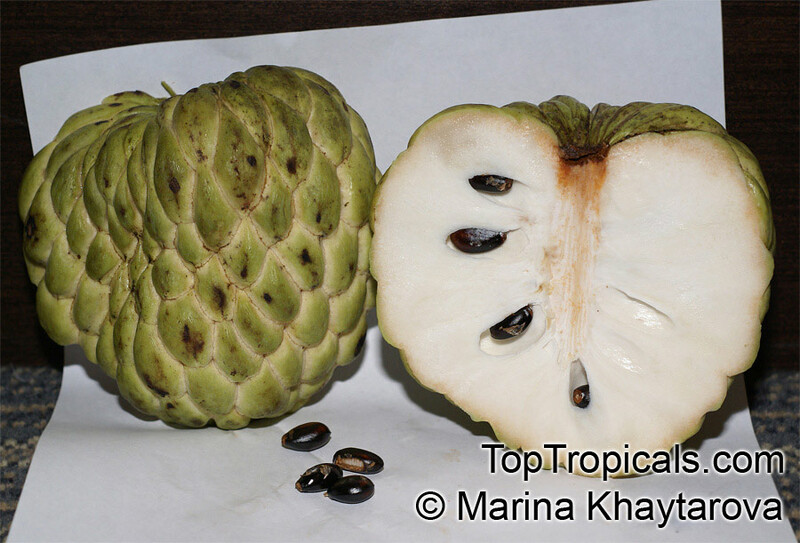 Sugar apple, sweetsop-anon, Sweetsop. 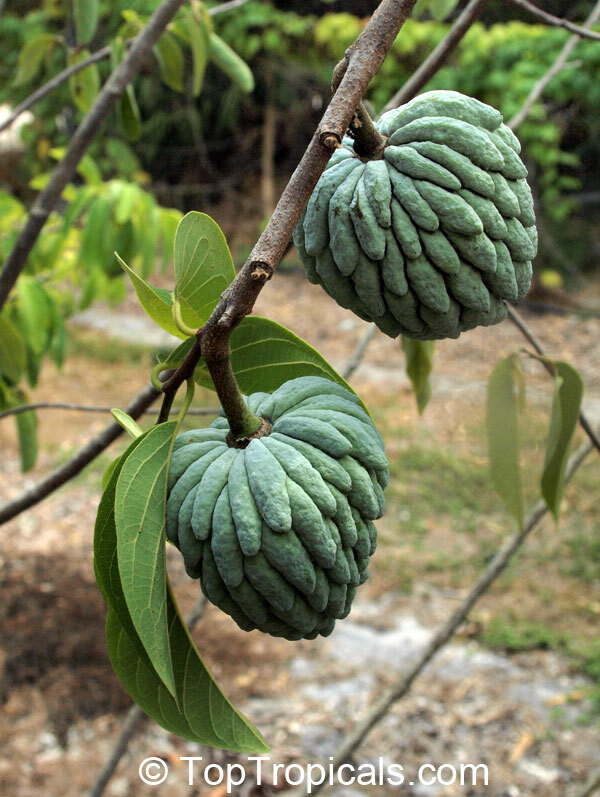 Sheer deliciousness. Sweet custard-like pulp. Very highly regarded in all tropical areas. 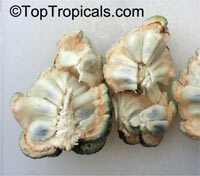 Needs bottom heat for faster germination, it takes one to two years for seedlings to start producing flowers. 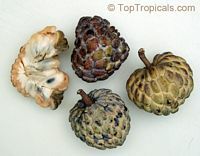 Sugar apples make great container plants. Plant seeds at 1" depth using well draining soil mixture. 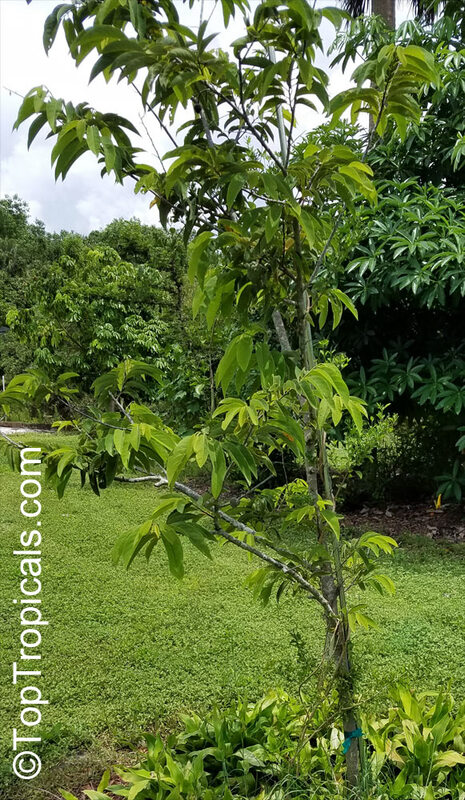 Keep damp, warm, and in bright light with high humidity. Slow germinating.